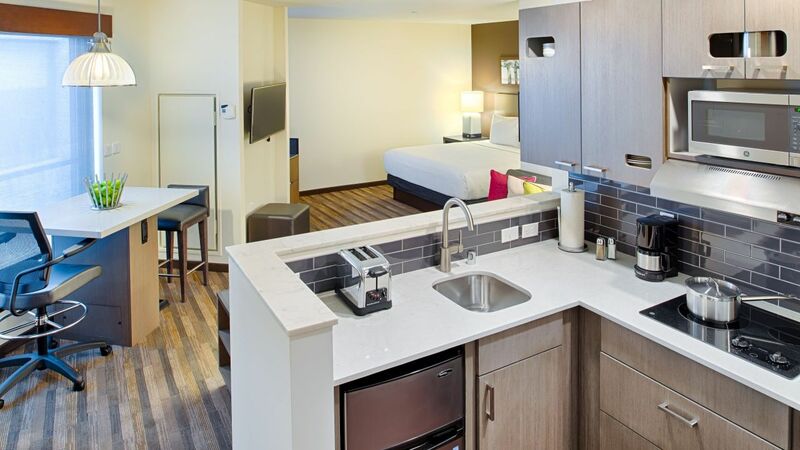 Hyatt House Seattle / Downtown is your home away from home. Get to work at your spacious desk, and sink into a plush bed after a full day. Enjoy an attractive view of downtown Seattle from your spacious studio giving you ample space to keep routines rolling. The spacious studio features a divided living and sleeping area with a sofa-sectional with sofa bed, two queen plush Hyatt Grand Beds®, and fully-equipped stainless kitchen. Other features include a spacious closet, 42" flat panel TV, dedicated workspace and a generous bathroom with a relaxing bathtub. With your stay, enjoy complimentary Wi-Fi and our Morning Spread breakfast with Omelet Bar. Our spacious one-bedroom suite gives you ample space to keep routines rolling. The spacious suite features a separate living room with a sofa-sectional with sofa bed, bedroom with one king plush Hyatt Grand Bed®, and fully-equipped stainless kitchen. Other features include an entry organizer, closet and dresser space, multi-purpose kitchen island with ergonomic chair and a generous bathroom with walk-in shower. With your stay, enjoy complimentary Wi-Fi and our Morning Spread breakfast with Omelet Bar. Our spacious one-bedroom suite gives you ample space to keep routines rolling. The spacious suite features a separate living room with a sofa-sectional with sofa bed, bedroom with two plush queen Hyatt Grand Beds®, and fully-equipped stainless kitchen. Other features include an entry organizer, closet and dresser space, multi-purpose kitchen island with ergonomic chair and a generous bathroom with a tub. With your stay, enjoy complimentary Wi-Fi and our Morning Spread breakfast with Omelet Bar. Our spacious studio gives you ample space to keep routines rolling. The spacious suite features a divided living and sleeping area with a sofa-sectional with sofa bed, two queen plush beds, and fully-equipped stainless kitchen. Other features include a spacious closet, 42" flat panel TV, dedicated workspace and a generous bathroom with a relaxing bathtub. With your stay, enjoy complimentary Wi-Fi and our Morning Spread breakfast with Omelet Bar. Enjoy an attractive view of downtown Seattle from your spacious studio giving you ample space to keep routines rolling. The spacious studio features a divided living and sleeping area with a sofa-sectional with sofa bed, one king plush Hyatt Grand Bed®, and fully-equipped stainless kitchen. 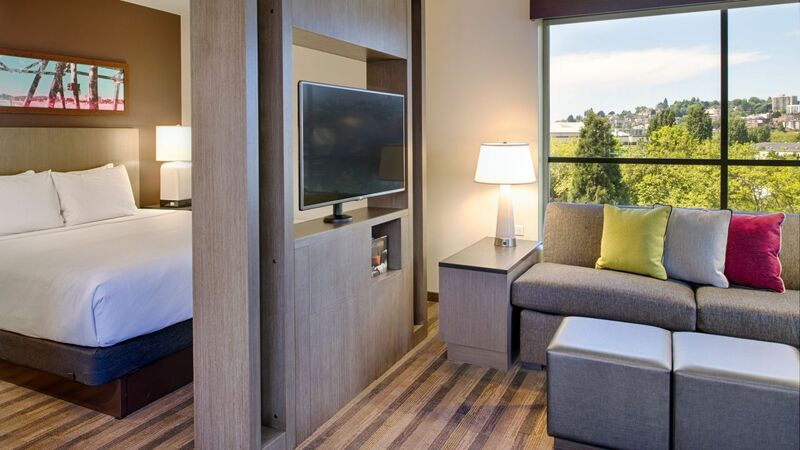 Other features include a spacious closet, 42" flat panel TV, dedicated workspace and a generous bathroom with a glass walk-in shower.With your stay, enjoy complimentary Wi-Fi and our Morning Spread breakfast with Omelet Bar. Our spacious studio gives you ample space to keep routines rolling. The spacious suite features a divided living and sleeping area with a sofa-sectional with sofa bed, one king plush Hyatt Grand Bed®, and fully-equipped stainless kitchen. Other features include an entry organizer, closet and dresser space, multi-purpose kitchen island with ergonomic chair and a generous bathroom with a glass walk-in shower. With your stay, enjoy complimentary Wi-Fi and our Morning Spread breakfast with Omelet Bar. Our spacious accessible one-bedroom suite gives you ample space to keep routines rolling. The spacious suite features a separate living room with sofa-sectional with sofa bed, bedroom with two queen plush beds, and fully-equipped kitchen. Other features include an entry organizer, closet and dresser space, and a generous bathroom with a tub. With your stay, enjoy complimentary Wi-Fi and our Morning Spread breakfast with Omelet Bar. 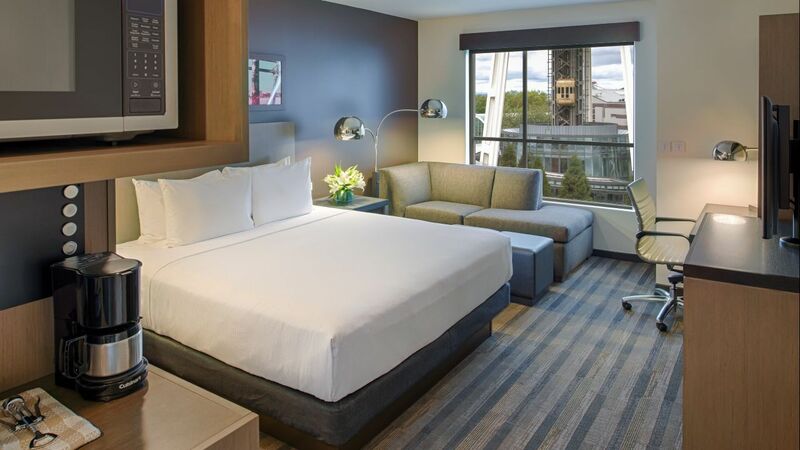 Enjoy an attractive view of downtown Seattle from your spacious king guestroom featuring contemporary décor and comfortable furnishings. 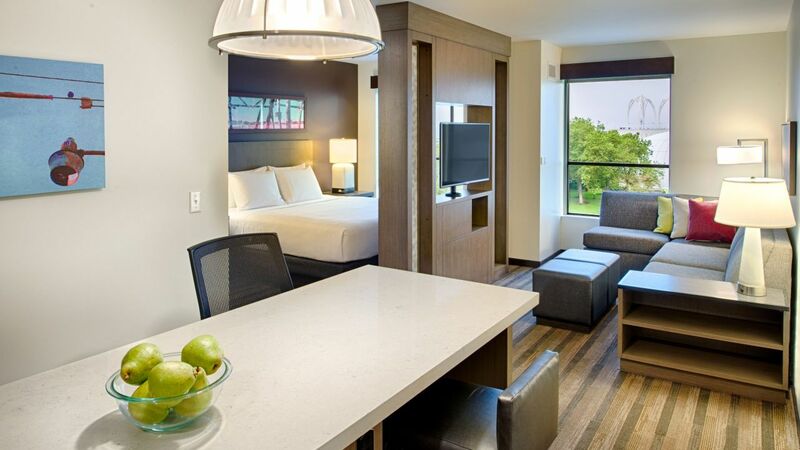 The spacious guestroom includes a seating area with a couch and a sleeping area with one king plush Hyatt Grand Bed®. Other features include a spacious closet, 42” flat panel TV, dedicated workspace and a generous bathroom with a glass walk-in shower. With your stay, enjoy complimentary Wi-Fi and our Morning Spread breakfast with Omelet Bar. 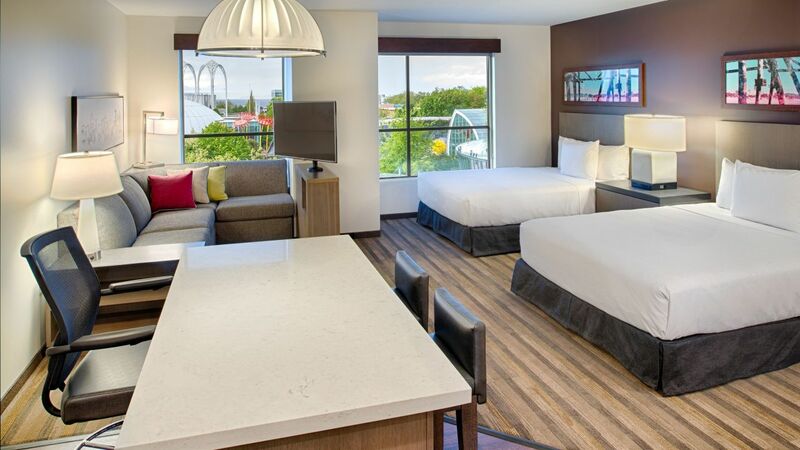 Our spacious king guestroom features contemporary décor and comfortable furnishings including a seating area with a couch and a sleeping area with one king plush Hyatt Grand Bed®. Other features include a spacious closet, 42” flat panel TV, dedicated workspace and a generous bathroom with a glass walk-in shower. With your stay, enjoy complimentary Wi-Fi and our Morning Spread breakfast with Omelet Bar. Enjoy an attractive view of downtown Seattle from your accessible studio giving you ample space to keep routines rolling. The spacious studio features a divided living and sleeping area with a sofa-sectional with sofa bed, two queen plush Hyatt Grand Beds®, and fully-equipped stainless kitchen. Other features include a spacious closet, 42" flat panel TV, dedicated workspace and a generous bathroom with accessible bathtub. With your stay, enjoy complimentary Wi-Fi and our Morning Spread breakfast with Omelet Bar. Our spacious accessible studio gives you ample space to keep routines rolling. The spacious suite features a divided living and sleeping area with a sofa-sectional with sofa bed, one king plush Hyatt Grand Bed®, and fully-equipped stainless kitchen. Other features include a spacious closet, 42" flat panel TV, dedicated workspace and a generous bathroom with roll-in shower. With your stay, enjoy complimentary Wi-Fi and our Morning Spread breakfast with Omelet Bar. 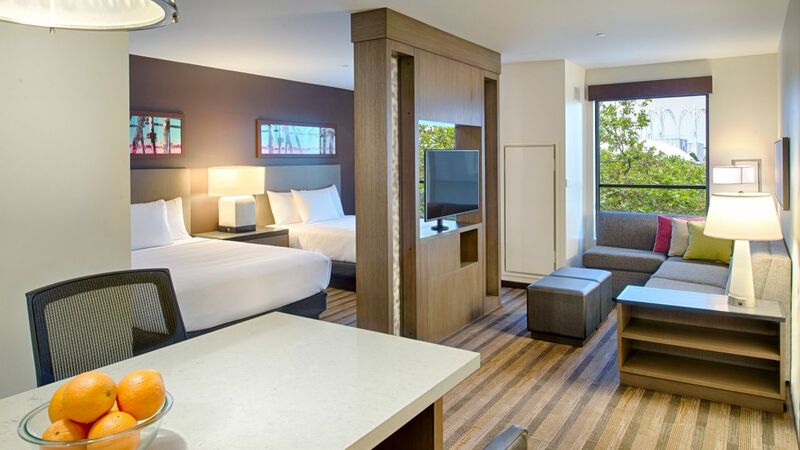 Our spacious accessible king guestroom features contemporary décor and comfortable furnishing including a seating area with a couch with sofa bed and a sleeping area with one king plush Hyatt Grand Bed®. Other features include a spacious closet, 42" flat panel TV, dedicated workspace and a generous bathroom with roll-in shower. With your stay, enjoy complimentary Wi-Fi and our Morning Spread breakfast with Omelet Bar.